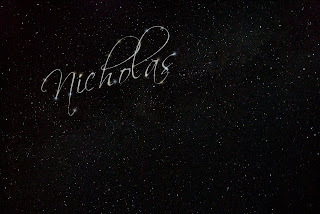 Thank you so much to Amanda at Written in the Stars for writing our sweet, Nicholas' name. I just love it! Amanda is a babylost momma who lost her daughter, Ireland, on March 14, 2009 at 14 weeks 4 days. Please take a moment and have a look at her site. It really is a beautiful tribute to her daughter. It is beautiful! I love the names in the stars. I just love how beautiful the names turn out in the sky. It's really cool! Beautiful! I love how Amanda started writing our babies names in the stars. So sweet of her.